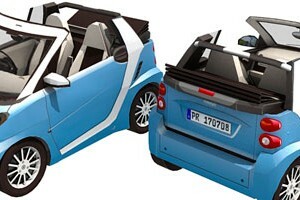 This model is simply a recolor version of the previous Smart Cabrio with light blue color. The differences are the L shape profile on each side is now colored black. Also front window frame, seats also repaint in black. The dashboard and side door panel colored in black with yellow. Racing stripes also added, to the front hood and the back of the car. The wheel also changed. The templates is added one page for left steer version of dashboard. The scale is 1/16, the templates consist of 10 pages of patterns. This model as I may say is the first detailed paper model of a car that I ever made. I was inspired to make this cute mini car when I was playing a game in my Galaxy tab inside a toilet and I saw a shampoo product advertisement which feature this Mercedes Benz Smart Fortwo car as the main prize. Then I searched on Google about this car and decided to make the model. If you have build some of Paper Replika models you should say this model is quite simple. All the detailed texture make this model looks complicated but I believe it is not. If you follow the instructions orderly, you will have no problem building it. At first I make this model in 1/24 scale but on the second thought I changed it to 1/16. Due to many request to release these Formula one car templates so here they are, I finally have the time to prepare and share them. These templates were used for making an exhibition decoration props in early 2011, commissioned by an event organizer. The original template was prepared to be use on extended A3 paper size in order to build almost 1 meter length of paper model, but now I have re-size them to fit into A4 paper size. 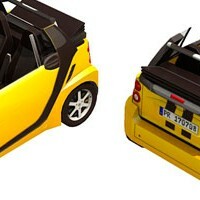 However the 3d model is not accurate, it was a quick modeling because of the deadline to met. 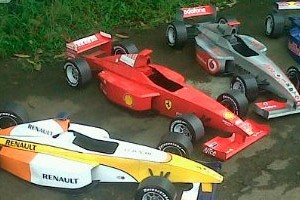 All racing teams share the same Formula One car shape and only one template of tires. The teams are : Red Bull, Renault, Ferrari, BMW and McLaren. The real ones have tires different on front which smaller than the rear one, but I use only one size. As I recall I never made assembly instructions for this, so the best I can provide is a PDO file of what's left of it. 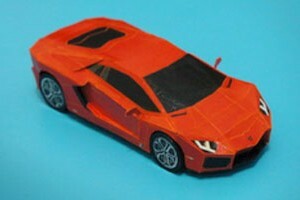 This is Yudho's latest creation, still in sports car theme this time he released a Lamborghini Aventador LP700-4 simple paper model template. Like his previous releases he still use 1:50 scale on this "bull" model. As you may already know Lamborghini car names are always bull related name. As well as Aventador, it is a name of a bull that won a Spanish Corrida. Yudho use 150 gsm laser printed Art paper and PVAc glue to build his model. 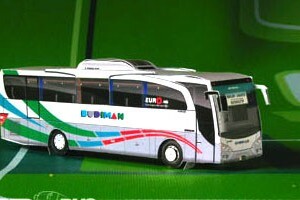 You can see more photos at Yudho's blog, this model is without instructions yet.